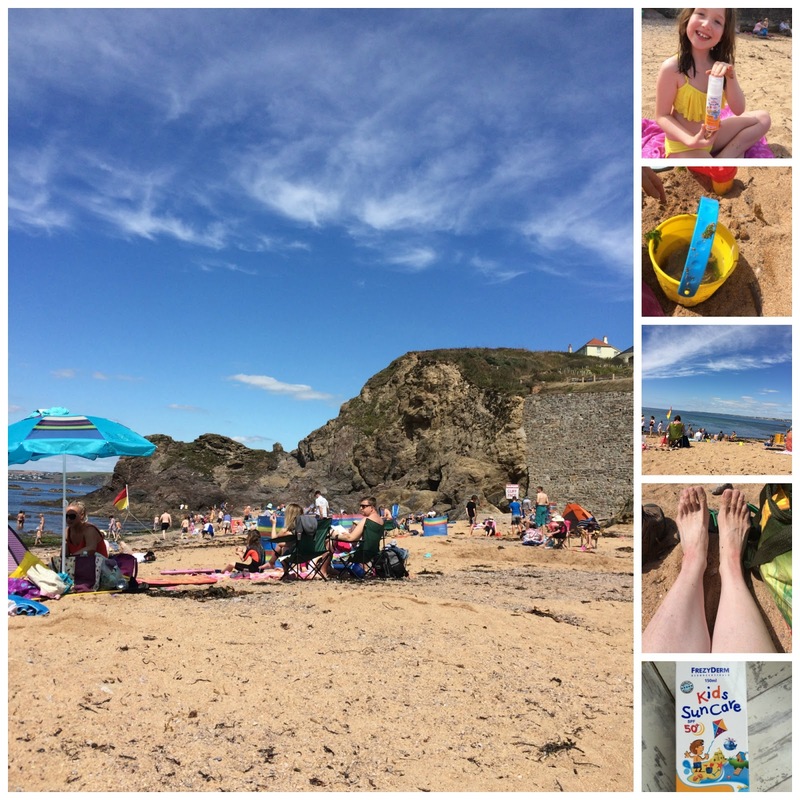 A gorgeous August day took us to explore the picturesque Hope Cove near Kingsbridge in Devon. The drive, although short, took us down a single track which involved much backing of the car to let tractors pass and the sighting of many a thatched cottage – real ‘chocolate box’ countryside. The sea was the kind of blue not seen very often around Cardiff, although the Husband says that the colour of the sea is a reflection of the sky, which given that the sky in Wales is so often grey, makes sense. Hope Cove has a pub, a cafe and a shop selling coffees, chocolate and pasties. We ensconced ourselves on one of the remaining patches of sand and made sure the kids were covered thoroughly in suncream. We had with us FrezyDerm‘s Kids Suncare SPF50+ Sun Lotion For Kids which is specially formulated for kids. It has a new generation of filters which provide very high protection against UVA and UVB rays. It is also water resistant, colour and parabens free. Uniquely, this sunscreen shields the DNA and strengthens its repair mechanisms. It protects against photoimmunosupression and provides effective antioxidant protection. We were in exactly the right place to test it and Ieuan, in particular, tends to redden and burn incredibly easy due to his colouring. The cream comes in a pump spray which makes it quite easy to control how much you use. We have experimented with some of the other spray on kids sunscreens on the market and found that you need to be quite a good shot and it takes you a while to get the hang of getting the sunscreen on the child and not the floor (although it may just be that I’m a terrible shot). The sunscreen has a light, pleasant smell and sinks it rapidly. There is a very slight stickiness so you are aware you have it on and it is also suitable for the face as well as the body. Caitlin also has quite sensitive skin and we have found that some other sunscreens bring her out in a facial rash. We were on the beach at around 11 am and FrezyDerm seemed to do the job. Ieuan did not come out in any red patches, despite being in the sea testing his new swimming skills. We stayed a good couple of hours and reapplied just once to Ieuan around the back of his neck. As an extra bonus, we found that this cream did not leave the kids covered in sand. The same, sadly cannot be said about the Husband’s car thanks to Caitlin’s new shell collection. "Relationship Dilemmas – What Was I Asked In Week 32?" "New Releases, Free & Bargain Books Link-up 12 August 2016"